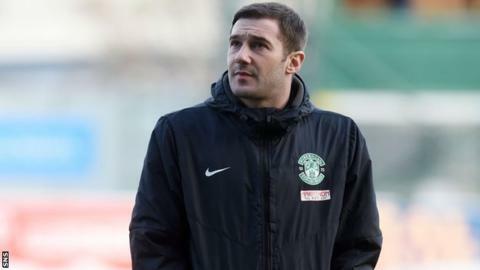 Head coach Alan Stubbs has indicated former Hibernian midfielder Kevin Thomson could return to the club on a player-coach basis. And Stubbs hopes to conclude a loan deal for Celtic forward Anthony Stokes on Monday morning. Thomson, 31, left Dundee on Friday after asking to leave Dens Park. "He's still got something to offer," Stubbs said. "He's got a wealth of experience and it could prove valuable to our end to the season." Thomson has had two spells as a player with Hibs, having been released in 2014 after the club were relegated to the Scottish Championship. The ex-Rangers and Middlesbrough man was at the Falkirk Stadium clad in a Hibernian tracksuit on Sunday before the Easter Road side's game with the Bairns. Stubbs explained a loan deal for Celtic striker Stokes, bringing the Irishman to Easter Road for a second spell until the end of the season, should be finalised soon. "We're just waiting on a couple of bits of paperwork getting signed and we can hopefully concentrate on getting Anthony on the pitch and doing what he's good at," added the Englishman.